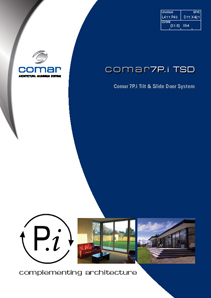 The Comar 7P.i Tilt Slide Door (TSD) System is the latest innovation to be included in the Comar 7P.i High Performance Range. The main advantage of the Comar 7P.i Tilt/Slide system is you have all the advantages of a sliding door system with the addition of a tilt mode to provide ventilation. It provides a unique solution where other door types would cause an obstruction internally or externally, maximising floor space and clear openings. Comar 7P.i TSD suites seamlessly into Comar 9P.i framing, like all Comar 7P.i products value engineering is achieved by the doors hanging directly from the frame; reducing sight-line, aluminium content and with this larger glass to frame ratio, lower U-values. Comar 7P.i is a semi-unitised system with fast-track installation through modular elements which can be coupled together and adjusted to suit site tolerances. PAS 24:2016 and Comar Architectural Aluminium Systems is a Secured by Design License Holder. On test Comar 7P.i TSD for BS 6375-1 the British Standard Classification for Weather-tightness, achieving Class 4:600Pa Air, 750Pa Water and 2000Pa Wind Resistance.Function is achieved by designing into this elegant profile suite the very latest, durable tilt/slide gear. Tested to over 200,000 cycles the slide and tilt gear are infinitely adjustable to ensure for long term operation.